When I updated the guest bathroom, one of things I didn’t want to replace was the built in medicine cabinet. 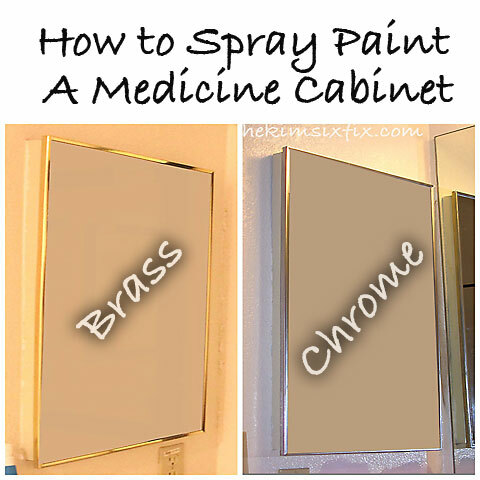 However, the problem was that the medicine cabinet was brass. Yes.. I know brass is supposed to be ‘trendy’ right now, but I am not a golden shiny brass kind of girl. Unlike the brass sliding shower doors, which I removed or the lighting fixtures and faucet, which I replaced, the medicine cabinet needed to be transformed. And it needed to be transformed without being removed. Metallic Finish Chrome Spray Paint. I admit, before I tried it, I was really skeptical. I mean how good of a finish could it really give me? But it was worth a shot. If it didn’t work I would have to replace the cabinet, but if it did, I would save more than $100. I originally painted this cabinet more almost 3 years ago. So how does it look today? AWESOME. Here is a photo of it just this morning. You don’t even notice it isn’t quite as shiny. Don’t you just LOVE spray paint?